A rumours heard Kibo was originally developed as a new version of Makalu (school or low EN-B) but it had too much performance and agility. By now I have flown UP Kibo M (85-115 kg) for 130-150 hours in all possible conditions, mostly on 88-92 kg take off weight, sitting in Advance Lightness 2 harness. The achieved longest flight has been 180 km. You can read my intensive experience in the article. Lines are sheated and tendency to knots is minimal. The “cloth” material seems durable but follows “go lighter” trends. Manufacturing of glider is flawless. It is possible to clean rubbish from inside of glider through the ears, I gladly used few times. Risers are thin and fine, brake handles standard. The attachment of brake handles need more pressure than others. 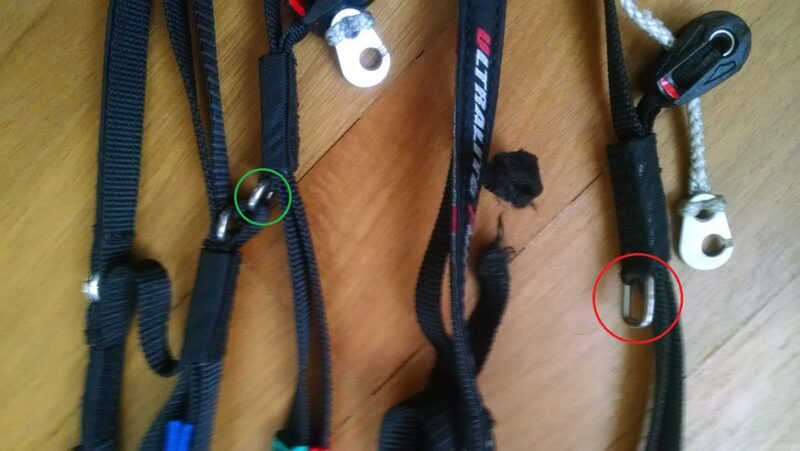 In some angles it seems impossible to deattach them. After intensive season a speed system on risers broke. Replaced immediately by manufacturer. It was caused by turning metal ring by 90 degrees which put additional pressure to one line. 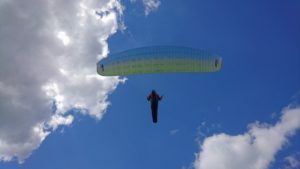 Manufacturer thanked me for feedback and promised to work on solution for new gliders. It influence only speed system, safety is not compromised. Red circle shows 90 degrees rotation of metal ring on damaged riser. Green circle shows correct position on new riser. Design and colors assessment is left to women. Glider start characteristic is lovely. All movements are rather slow. First goes the middle and ears fluently follows. In gentle wind, it is easy to build a wall just above the ground to precise lines check, then gentle pull gets glider moving up. Kibo moderately slows down just before reaching optimal take off position by itself, touching brakes is not required if turn is fluently followed by running. On winch Kibo very precisely followed a direction of rope and most corrections were done by C risers only. 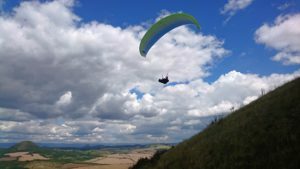 Very subjective topic, turning feels like more high aspect ratio gliders, as UP Summit XC3. Turns are sharp and precise. Not supripisingly for its class, agility is dumped but with little head up and stronger input, Kibo turns on ear easily. Brake travel is moderate. I used wraps very rarely, only in boring and long thermals. Kibo gives sensitive feeling of themals. In my harness I have never had feeling I missed even a small thermal. Dynamic of glider is within its class (=medium). Wingovers can be high and dynamic but as soon as you stop feeding them, they calm very easily. Kibo is a calm glider. Even in very strong central Alps’ thermals, Kibo prefers to move slowly above your head, softening is rather rare, and only in very bumpy air. I cannot imagine how it must feel on top of the weight limit. Pushing the full bar does not change anything in this behaviour! Often, when my friends said the air is wild, I enjoyed a comfortable ride. I appreciate slow tendency going from sharp turn to spiral dive, making thermalling tight thermals very effective. It is also useful for comfortable low G “sub-spiraling” in stable 4-9 m/s sink. Additionally, flying with C risers is fine but needs practice as there are various ways how to hold them. At beginning it felt too high but now it is fine. Kibo is IMHO easier to get up in weak conditions than Summit XC3 or Comet 2 which I flew a lot. Feeling and handling helps a lot to it. A (my?) weakness is in broken thermals. As I flew mostly along to EN-C/D gliders, these pilots transform separate thermal bubbles visibly more effective. Glide ratio is difficult to measure. Bear in mind I often flew along EN C/D gliders! When not against the wind, I comfortably joined gliders in the similar altitude. After glides against the wind, I arrived later and slightly lower. I am sure glide for its class is comparable to “best” gliders, all my flights along C/D gliders are a valid arguments. Those chasing numbers can check the tracklogs at the end of the review. Speed system is moderately long and strong. Its nice characteristic is fast, but fluent reaction even when pushed instantly. Compared to UP Summit XC3 here is a visible lack of top speed. All EN-C/D gliders are faster during speed glides. This limits usage flying into headwind and competitions, those considering of Kibo/Summit should think about it. But compared to other gliders I flew, sink rate increase with speed is linear, not gradual. I often used thermalling->fullbar->thermalling->fullbar… method. Having 5 asymetrical collapses by now. 2 in spring Alps conditions, about 50%. 2 of them were in high risk areas (above Bischling rocks and lee side near Dachstein). 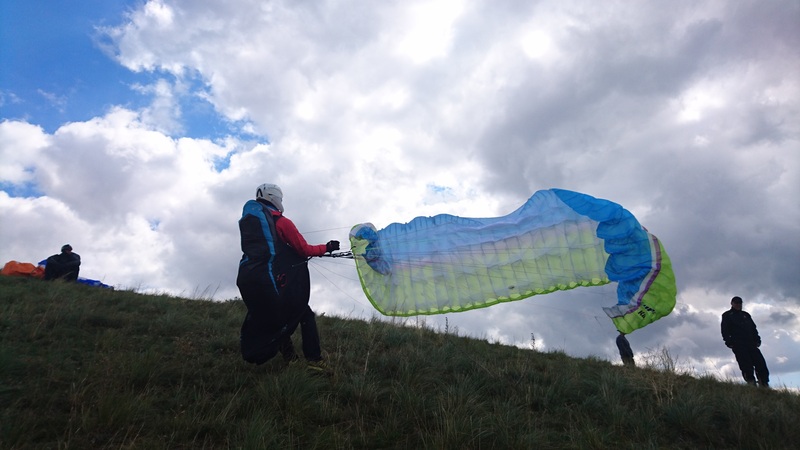 Both were very fast, but glider behaved like a puppy, reinflated almost instantly and maintaining same direction. Other 3 collapeses I almost did not notice, continued flying without any correction. Of course automaticly, some correction have been performed by me during all these collapses. Unlucky to get any real frontstall. Manual collapses needs to be initiated by holding lines, risers are not enough. During SIV it felt absolutely comfortable for me. Check video bellow. Ears needs to be pulled by lines, again risers are not enough, but it is easy, stable and fluently reinflates when released. It is difficult to make any objective statement but the fact is that collapse rate per flight hour is the lowest I ever had, maybe only UP Summit XC3 is similar but with less hours. Still cannot make a conclusion as this could be by having finally enough experience or just a luck. Kibo seems natural choice for any beginner XC pilot, or experienced daddies/mommies looking for extra passive safety. I love turning behaviour, fluent speed system and comfortable ride. Until met a signifficant headwind, any pilot can fly 100+ km flights with Kibo fast and easily. I would buy it again without any regrets. Those seeking facts and numbers can analyse some glides together with other gliders on xcontest.